Today Google launched yet another service to complement Google Maps and Google Maps for Mobile: live traffic information for major cities and regional centres. Traffic congestion indicators are currently available for major and minor arterial routes in Sydney, Melbourne, Brisbane, Wollongong, the Central Coast, Geelong, the Sunshine Coast and the Gold Coast. To display traffic information on Google Map simply click on the button labelled 'Traffic' and a colourful mesh of lines will be overlayed on the base map. Red lines indicate congested routes and green lines depict streets with free flowing traffic. 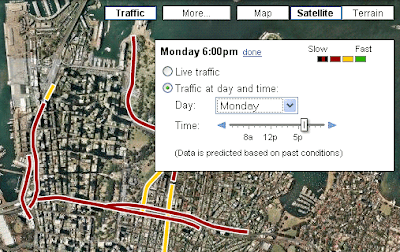 Google also offers an option to view traffic conditions at different times of the day and on different days of the week. The data is predicted based on past conditions and is not an indication of what exactly was the traffic situation eg. “last Monday”. To access this functionality just click “change” option on the traffic legend. It is quite interesting how Google generates the information in real time. In particular, it is derived by “crowdsourcing”. That is, Google collects information from people who have Google Maps for mobile running on their GPS enabled phones and who have chosen to enable ‘My Location’ service. As they drive along city streets the phone sends anonymous bits of data back to Google about how fast the device is moving. By combining that anonymous speed data from thousands of mobile devices travelling on the roads Google can compute live traffic conditions and generate Google Maps traffic layer. The more people that participate the more accurate the information. Google is very strong on enforcing privacy protection measures so the information is collected only from people who choose to participate and is totally anonymous. With the release of traffic information service for Australian largest cities there is an opportunity for a great improvement to Google’s driving directions service: adding an option to “avoid congested roads”. It would nicely complement “Avoid highways” and “Avoid tolls” already available as additional filters for defining the most appropriate route.